We've seen a few examples of the Nokia Lumia 920 optical image stabilization mechanism at work, but those were in fairly pedestrian situations, like walking around the city streets or at concerts. 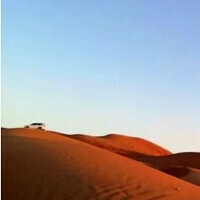 To truly put the OIS suspension mechanism inside the Lumia 920 to the test, the phone has been tied to the front grill of a Land Rover, and taken for a dune ride as part of a desert safari tour. Needless to say, the OIS tech, which is able to compensate for up to 500 movements a second, held its own perfectly at the front of the jumpy vehicle, and delivered steady Full HD footage of the desert sands around, proving once again that the only phone with optical image stabilization is a truly innovative device in this day and age where we take multicore processors and HD screens in our handsets for granted. An "awesome" word from someone of your stature is "it"!!! Get it people, the dark knight recommends it! That video is awesome...wish they did a comparison of other phones too in similar situation to clearly understand the benefit here...good job Nokia. Land rover?? Damien are u there? a word to describe to nokia camera technology that isnt shocking anymore... AMAZING! Except mars is extremely cold. The 920, New Kid on the BlocK!